September 2013, Bremen, Germany – “My last game in green” ran the legend – the player retiring being German association football legend Torsten Frings, and the green, the colours of Werder Bremen, the club he had served with distinction for almost 18 years. The venue – where else? 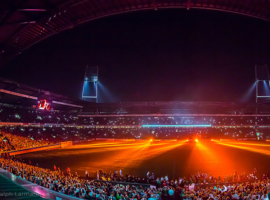 – was Bremen’s Weser Stadium, and A&O Technology, as technical service provider, had prepared an unforgettable multimedia light show to mark the occasion. 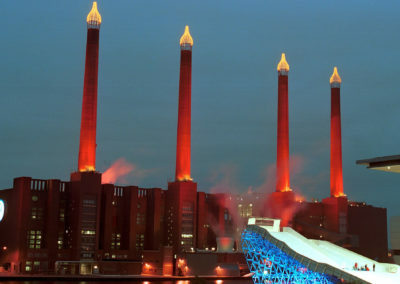 LED/hybrid searchlights and a laser projection at the Weser Tower lit the way to the Chilli Club, where the exclusive after-show party was held. 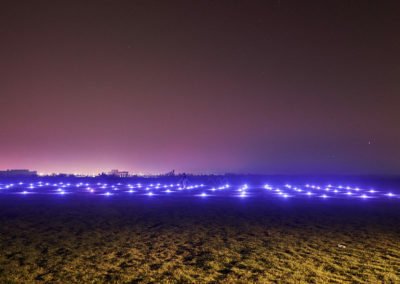 The light show, designed and programmed specially for the occasion by A&O Creative, was implemented using high-powered searchlights from the company’s own range as well as laser projectors. They’d come to give him a fitting send-off – Bremen’s Weser Stadium was sold out – and Torsten Frings, who was making his farewell appearance, was visibly moved. An all-star line-up of former teammates and friends of the player had accepted Frings’ invitation to take part in the friendly, Johan Micoud, Dieter Eilts, Oliver Kahn, Michael Ballack, Thomas Schaaf, Tim Wiese and Michael Schumacher being just some of the sporting legends in attendance. 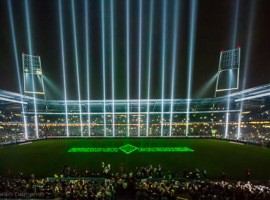 When the match was over, there was another treat in store: the city – once part of the Hanseatic League – had commissioned a spectacular light show and in the end it hardly mattered that the Werder Allstars had won 8:7 against the team of Torsten & Friends. The event marked the end of one chapter in Frings’ illustrious career and the start of another, as his aim now is to achieve as a trainer success at least equal to that he enjoyed as a professional footballer. 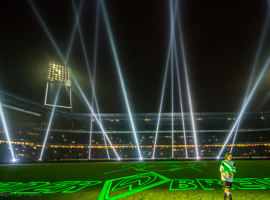 For the occasion, A&O Technology had transformed the Weser Stadium into an enormous stage bathed in green and white light. 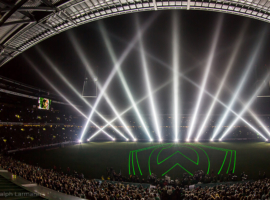 Using powerful FALCON BEAM 7,000W xenon searchlights and 15W laser projectors, A&O Creative, the company’s design specialists, had fashioned in light a tribute to the player and the success he had brought to the club. 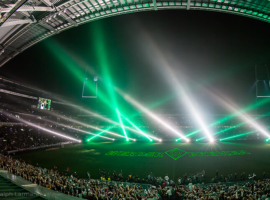 Individual laser images told the story of his professional career whilst beams of green and white light filled the stadium and the sky around. 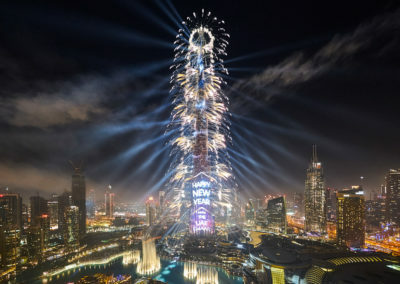 It was an impressive climax to the festivities that crowned a joyous farewell. The celebrations ended in the Chilli Club. 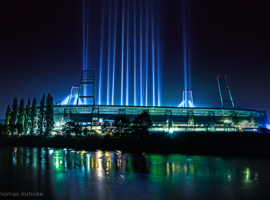 On the way there, the four hundred invited guests were treated to another light and laser show at the Weser Tower. The LED video panels and the beams of the LED/xenon hybrid searchlights took up the evening’s leitmotif of green and white. Behind them, on the facade of Bremen’s Weser Tower, a laser projector displayed a portrait of Frings, the Weser coat of arms and a variety of other football-related applications.